During a recent gathering with my local BurdaStyle sewing group, I learned of a website called Sew Daily from the Interweave group that publishes Stitch magazine. The site has quite a few free pattern downloads available, the caveat being that the download only contains the pattern pieces and the instructions are found in a corresponding issue of Stitch magazine. I found a pattern for some fun kids pajamas that appeared in the Spring 2011 issue, the Comfy Sleep Set. I don't have the issue but decided to give them a try anyway. The pdf download includes the pattern pieces for the shirt and the pants, and it provides the dimensions for the various bands of ribbing. In this post from the pattern designer's blog, you can see that there is ribbing around the waist as well. The only thing I wasn't sure about was the size of the seam allowance (which I assumed was included in the pattern), so I just went with 1/2" and that worked well for me. I used a mix of fabrics from the stash - the striped fabric came from a thrifted t-shirt, the solid in the bodice is leftover from when I made these leggings, and the rib knit is from Joann, purchased in anticipation of one day needing it for toddler-wear. L is currently nearly 20 pounds and 30 inches tall - I made the 12 month size and there is plenty of room for growing, which is a plus. Stitch Magazine offers the pattern in sizes newborn - 12 months, and Bonnie Ferguson added sizes 18 months - 5T on her blog - how cool is that? I definitely see more of these in my future, and they are a fun way to use scraps and repurpose old tees. What a sweet playsuit. I think I am clucky for grandkids - I have an urge to sew sweet little things for sweet little things. So cute! I always have trouble finding baby patterns that fit well for gifts. I'll have to download this for the baby pattern stash. Thanks! Cute, cute! Your little princess is growing so fast! Sew cute!!! L is getting so big...seems like yesterday you were sharing the good news! Thanks for sharing this good pattern news...I need to scoot over there and get it to make some pjs for my Grandson! Thanks again! Really adorable and comfy-looking. L is is a cutie. Gosh L is getting so big and so adorable! 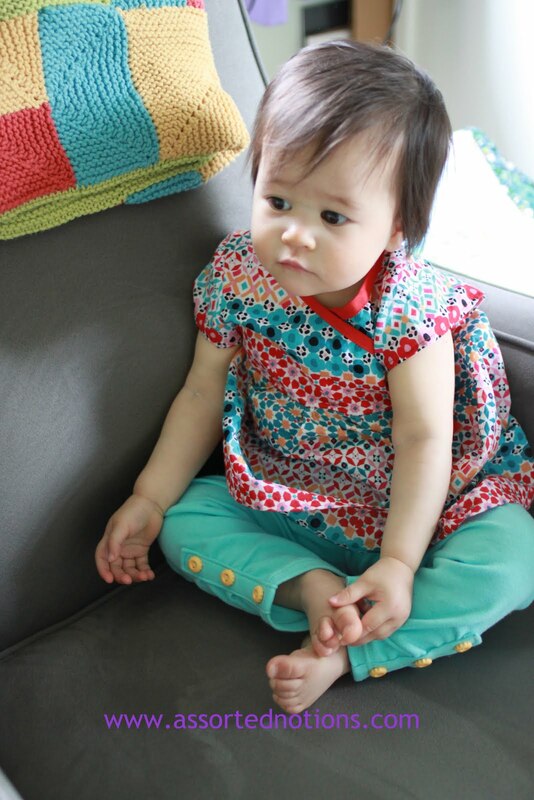 This is a cute set of pjs and any pattern that includes sizes to a 5T is a goldmine! You will make these effortlessly for years to come. Great pj's and when you make your own you can be so inventive with colour and print - great fun! Adorable!!! & what a great pattern. ridonkulously cute? check! thanks for the info. I sometimes buy Stitch but don't have this iss - this was the one pattern that really appealed to me so it is awesome to know I can download it. I used to be able to buy tons of wonderful knit fabrics, ribbings, etc... from a woman who had a shop in her garage. My girls were toddlers back then and it was heaven! I don't think there's anything that compares to sewing for toddlers, so have fun! L is absolutely adorable, I miss those days. Super cute! I love the way you combined the fabrics for this set. Love your Comfy Sleep Set! It looks perfect! The set looks great! I have been wanting to try this pattern as well, but like you, I don't have the copy of stitch. One thing I am wondering--do you hem to two front pieces together, or hem them each separately them sew everything together? Thanks! Wow! Fantastic - and I didn't even think about the scrap aspect! Great Job New Mommie! !